The newest material in luxury is actually centuries old. Made of authentic fireclay, our exclusive Blanco Cerena is durable, beautiful, and versatile. This reversible sink is a perfect fit for both traditional and contemporary kitchens. – Due to dual-style design, no cutout template is provided. The sink should be used as a template. Unique apron front reversible design allows for contemporary or traditional decor applications. Fireclay material allows for perfect, smooth, and easy-to-clean surface. 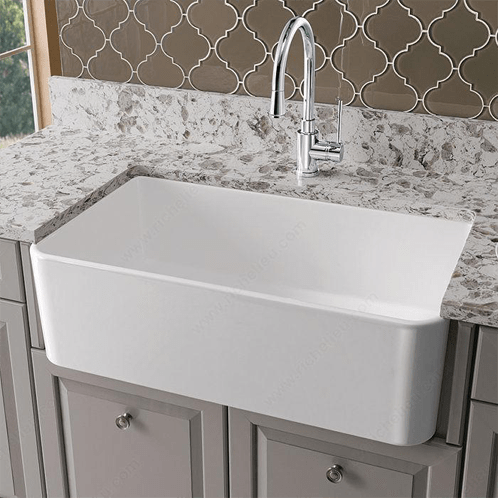 Crafted with artisan hand-finishing techniques and high-firing temperatures, Blanco’s fireclay sink delivers an extremely lustrous and durable surface that is shock-resistant. Fireclay material will also withstand heavy use over time and will resist scratching, staining, and chipping. And since our Blanco sinks will not rust, fade, or discolor, they are sure to add enduring beauty to your kitchen for many years to come. 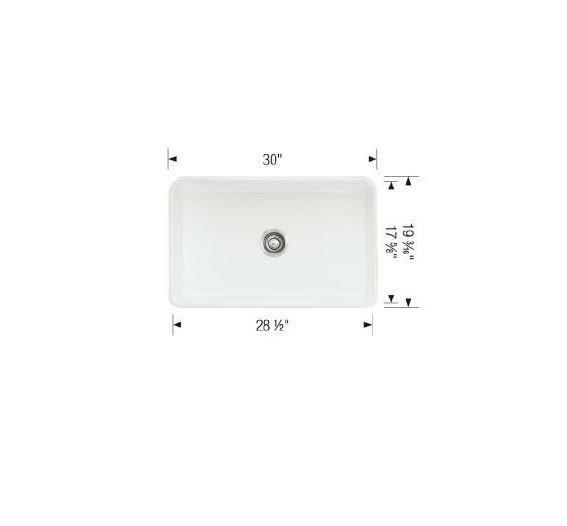 – Size of cut out: the provided template leaves approximately 1/8″ of the sink rim.
! No template or DXF file provided, recommend the use of sink for determining final cabinet and countertop dimensions. – A custom sink base and support system are required for installation of this sink. The cabinet area beneath the sink MUST be reinforced to provide sufficient support.